One of the best Croatian drum&bass producers and DJs. His music can be found in mixes of many domestic and foreign DJs. 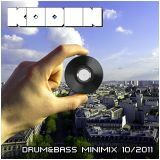 Kodin released first Croatian drum & bass vinyl, „Girl In A Delirium“ on British Ascenzion Records in the year 2007.